You see it don’t you? I know some of you do, and for the rest of you, let me zoom in a bit. There it is, above the garage door on the right. Do you need a closer view? What is that? 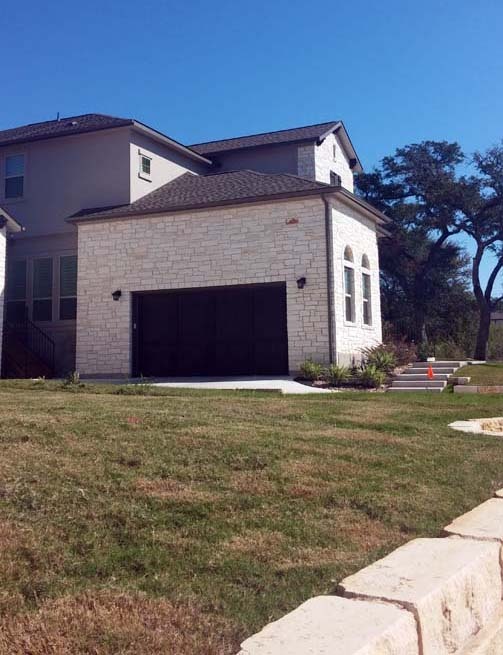 Try to look at the house now, and I promise you, the first thing you will see is not the house, lawn, and stone retaining wall (yes, did you notice the wall?) but this one orange-reddish-brown-out-of-place stone. This flaw. Did your eyes go right to it? Mine do. Every. Single. Time. Ugh. 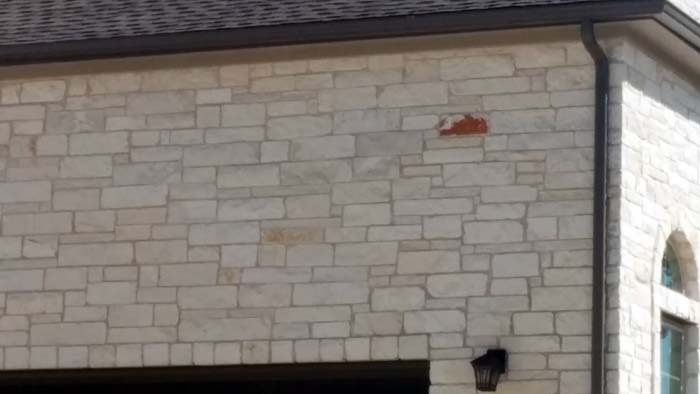 My question is why did the mason use this stone? What was he thinking? How hard was it to grab another stone, one that matched all the others, and cement it in place? During my quiet time this morning I read, “Never believe that the so-called random events of life are anything less than God’s appointed order. Be ready to discover His divine designs anywhere and everywhere”. –Oswald Chambers. Then I went for a walk and I saw this out-of-place stone. 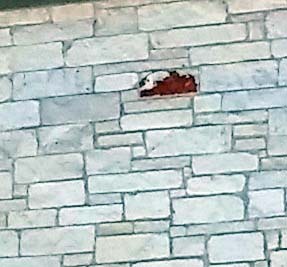 Now, I’m not going to suggest that God prompted that stone mason to look for a flawed stone and put it there just so I would walk by one day and see it and write a blog, but I will suggest that God just might be using this stone to prompt some soul-searching. Could it be that God might actually use this stone to reveal flaws in our own hearts and character? Could it be that God deliberately left that annoyance in place specifically to rub us wrong? Could it be that the irritation is actually God sanding something off? “And we know that God causes everything to work together for the good of those who love God and are called according to his purpose for them. For God knew his people in advance, and he chose them to become like his Son, so that his Son would be the firstborn among many brothers and sisters” – Romans 8:28-29 NLT. Does someone near you have a flaw that deeply annoys you? Could it be that God deliberately placed that person next to you in order to file off a callous from within your own heart? Could it be that God is using that person – and their flaw – to remove something corrosive from within you? Could it be that God purposefully placed that person next to us, planted them in our family, or parked them in the adjoining cubicle for his good purpose? Back to the house, what is this specific stone revealing in you and in me? A need for perfection? Only God is perfect. If any of us requires perfection in any other person, we will be let down, disappointed, and frequently annoyed. Brian and I were talking about this stone the other day when we went for a walk and he joked that he’s going to get a ladder one night when no one is looking and paint it. That’ll fix it, ha! Nevertheless, that’s what most of us do with our flaws. We hide them behind a whitewash of phoniness and hypocrisy. We know they are there, but rather than confess and work with God toward sanctification, we chaff at the sandpaper he uses; and typically that sandpaper is other people. But there’s another way to look at this stone. An artist would look at this house and think it is perfect; that little pop of color up there is beautiful! A stroke of genius! We should commend the mason who chose that stone for his boldness to cement it in place. 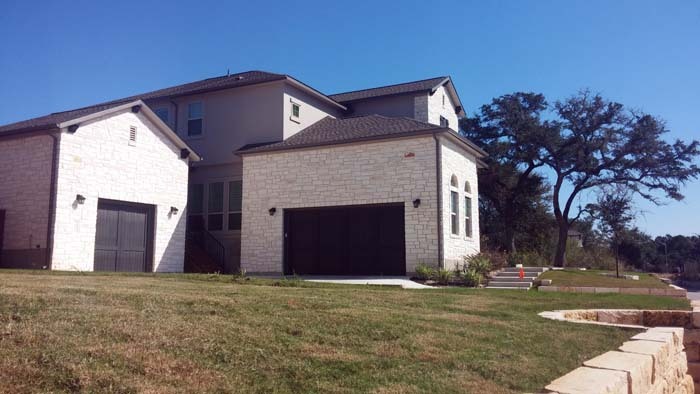 The stone may not match and it may look out of place, but without this particular stone, the house would be drab and dull and look just like every other house that is built of white Texas stone. Maybe God is using this stone to remind us that we are not like the rest of the world; that as his children we are different, and our difference should stand out as starkly as this stone does. Do you? Do I? Or do we blend in? Furthermore, does your being different look like a flaw? Do you continually bring out the worst in people? Or are your differences revealed as beautiful strokes of creativity and love molded by the Creator for his good purpose? I’m thinking that will be on the punch list and fixed!